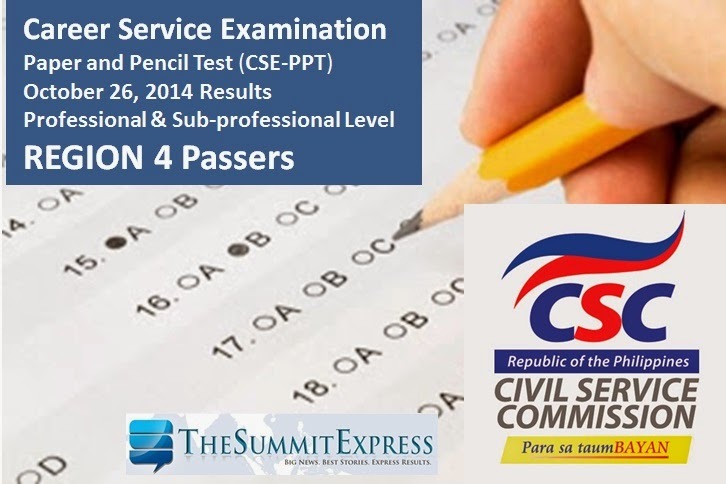 Manila, Philippines - The Civil Service Commission(CSC) has finally announced the full results of October 26, 2014 Civil Service Exam- Paper and Pencil Test (CSE-PPT) also known as Career service examination on Tuesday, December 9, 2014. The complete list of passers for Professional and Sub-professional level for Region 4 (CALABARZON and MIMAROPA) are available on this page. CSC said that more than 170,000 registered examinees took the Civil Service Examinations in 52 test locations nationwide. Region 4 (Southern Luzon) has the biggest number of examinees at 28,548, of registered examinees covering both Professional and SubProfessional levels.